It seems so long ago that the Trivial Pursuit fad grabbed the country. As I predicted at the time (and I must add that such clairvoyance required neither supernatural powers nor a hotline to the Almighty), the addiction to those little cards soon faded. But not before a lot of other games based on the premise that a room full of people required a stack of such cards simply to engage in conversation or otherwise enjoy themselves popped up on department store shelves. 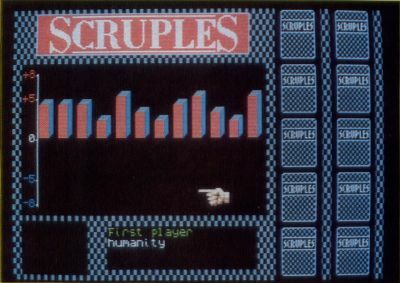 Scruples was one such game. The object of the game is to pose a moral dilemma to a person and force him to answer it to the satisfaction of the rest of the group. The winner is the player who is able to predict who will answer each question in a given way. Such a question might be: Would you return a wallet that you found on the street, if it contained $1,000 and no one knew you had it? And while I find little pleasure in such a contest, a number of people do, and did, and more power to them. But the computer version, or should I say perversion, is another thing entirely. What I find truly ghastly about this game is the fact that you play against computer-generated and -controlled people, infinitely inferior to real people. I'll disregard the option that allows you to play with real people, as I feel, as usual, that there is no need to insert a computer into a game such as this. It simply gets in the way. 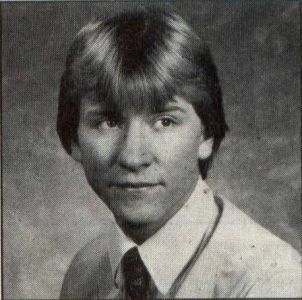 So the person most likely to play the game can best be described as follows. Presumably the most likely player of computerized Scruples enjoys the board version of the game but can find no one to play Scruples with. Possibly he has no friends at all. So this lonely person selects a number of computer-generated "friends," who have been given ratings in 12 traits such as honesty, truthfulness and greed. This person then tries to predict how his computer friends will solve their moral dilemmas. What is even more ludicrous, these imaginary people can even argue with each other when they disagree. And you can argue with them, choosing from four canned responses. But I'm not going to argue with you. 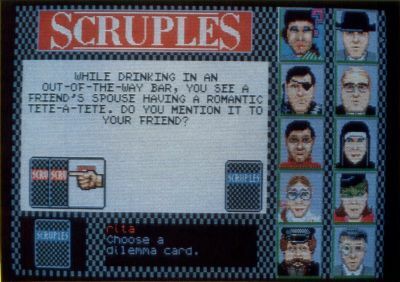 If you feel that you have to play Scruples against a computer, run right out and get this game. However, I feel that most players will immediately realize that the main ingredient of this game has been removed: the infinite complexity of human personalities and relationships. And with this removed, there is little left. The bottom line: Skip it.